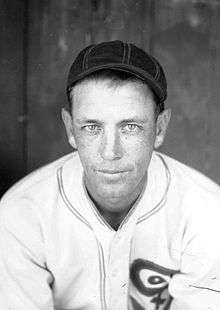 Lyons in 1930 with the Chicago White Sox. ↑ "Chicago White Sox Top 10 Pitching Leaders". Baseball Reference. Retrieved 14 January 2011. 1 2 Bullock, Steven R. (2004). Playing for Their Nation: Baseball and the American Military during World War II. University of Nebraska Press. pp. 110–111, 135–136. ISBN 0-8032-1337-9. ↑ "Lyons' jersey retired". Milwaukee Journal. April 22, 1943. Retrieved December 5, 2014. ↑ Hoff, Dave (May 8, 1943). 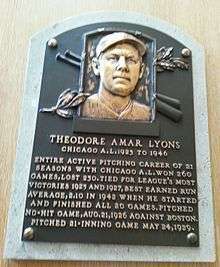 "Lyons plans return to mound after war". St. Petersburg Times. Retrieved December 5, 2014. 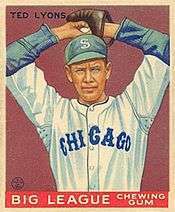 ↑ "Pitcher Ted Lyons new Chicago skipper". Montreal Gazette. May 25, 1946. Retrieved December 5, 2014. ↑ "O'Connor said to have left Chicago Sox". Daytona Beach Morning Journal. October 6, 1948. Retrieved December 5, 2014. ↑ "Chicago writers to honor Ted Lyons". Reading Eagle. January 5, 1968. Retrieved December 5, 2014. ↑ "Hall of Famer, Ted Lyons". Bangor Daily News. July 25, 1986. Retrieved December 5, 2014.